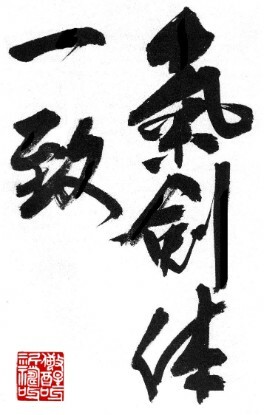 Calligraphy: "Ki Ken Tai Ichi" -Spirit, Sword, and Body - are One. The following teaching is the collection of golden wisdom of the great Martial Artists. For a true warrior: resistance, anger, overconfidence, pride, harshness, conceit, and etc. are the signs of weakness rather than bravery. I would encourage you to ponder on Masters words, then try to apply them into your very own life, and make it all the difference. A young man traveled across Japan to the school of a famous martial artist. When he arrived at the dojo he was given an audience by the Sensei. 'What do you wish from me?’ the master asked. 'Ten years at least', the master answered. 'Ten years is a long time', said the man. "What if I studied twice as hard as all your other students?'. ’Twenty years at least', replied the master. 'Thirty years', was the master's reply. 'How is it that each time I say I will work harder, you tell me that it will take longer? ', the man asked. 'The answer is clear. When one eye is fixed upon your destination, there is only one eye left with which to find the true Way". Renowned Bruce Lee once said, "Truth is the daughter of inspiration; intellectual analysis and partialized debate keep the people away from the Truth. It is like a finger pointing a way to the moon. Don't concentrate on the finger or you will miss all that heavenly glory". Welcome to the treasure – the wisdom of great Masters. Running horses are retired to till the fields. War-horses are bred in the countryside. No fault is greater than possessiveness". "Weapons are instruments of fear; all creatures hate them. Therefore followers of the Way never use them. [But] He uses them only when he has no choice. The war is conducted like a funeral. That is why a victory must be observed like a funeral". "So it is said that victory can be made. The true object of war is peace. "To fight and conquer in all your battles is not supreme excellence; supreme excellence consists in breaking the enemy's resistance without fighting... The skilful warrior subdues the enemy without any fighting. He will win who knows when to fight and when riot to fight. He will win who prepares himself, waits to take the enemy unprepared. If you knew yourself but riot the enemy, for every victory gained you will also suffer a defeat. "The good warriors of old first put themselves beyond the possibility of defeat, and then waited for an opportunity of defeating the enemy... Hence, the skilful fighter puts himself into a position that makes defeat impossible and does not miss moment for defeating the enemy. Thus it is that in war the victorious strategist only seeks battle after the victory has been won, whereas he who is destined to defeat first flights and afterwards looks for victory. Therefore, when people are skilfully led into battle, the momentum is like that of round rocks rolling down a high mountain - this is force! "Use anger to throw them into disarray, use humility to make them proud. Tire them by fire, cause division among them. Attack when they are unprepared; make your move when they do not expect it. Be extremely subtle, even to the point of formlessness. Be extremely mysterious, even to the point of soundlessness. Thereby you can be the director of the opponent's fate". "Instead of the outer, the inner. Instead of the folly of heroism, the reason of moderation. Instead of glories of youth death, the pleasure of a long full life". "Once you begin to move, the entire body must be light and limber. Each part of your body should be connected to every other part. The internal energy (Ki/Chi) should be extended, vibrated like the beat of a drum. The spirit should be condensed in toward the center of your body. When performing T'ai Chi, it should be perfect; allow no defect. The form should be smooth with no unevenness, and continuous, allowing no interruptions:"
"Observe the ability of the old man who can successfully defend himself against many opponents at once. This proves that speed does not determine victory. Look into the technique of using four ounces of energy to control the force of thousand pounds. Such techniques as these do not depend on brute force to overcome. When to move, your movements should revolve as effortlessly as the turning of the wheel. Following the changing situation, you move as is necessary. If you are unable to respond in this way you will become double-weighted. Often martial artists who have practiced for years still cannot move properly and so cannot follow the flow of their opponent's movement. This is essentially because they are hindered by their mistake of double-weightedness". "In performing the forms, you should be like eagle which glides serenely on the wind, but which can swoop instantly to pluck a rabbit from the ground. Your mind should be centred, like the placing cat - peaceful but able to respond instantly to the scurrying mouse. First you should exercise your mind, and then discipline your body. Relax your abdomen and let internal energy (Ki/Chi) condenses into your bone marrow. Make your spirit peaceful and your body calm. Pay attention to your mind at all times. Your entire body should be controlled by the mind and spirit. When in stillness you should be as the mountain. When in motion you should move like the water of the river. Bear in mind that once you move, everything should be in motion; when you are still, everything should be in stillness. "When you are extremely soft, then you become extremely hard and strong. "Be still as a mountain, move like a great river". "When your opponent comes, greet him at once. If he withdraws, immediately send him on his way. When there is opposition, harmonize with it on the spot. Utilize all principles to achieve harmonization. There is nothing in the universe that cannot be harmonized. Immediately distinguish between truth and falsehood. Know how to discern the hidden. Small enters the tiniest particle. Adjust to the vagaries of life and death. Remain unshaken regardless of the circumstances”. "Songs of The Way of the Spear"
The unskilled man does not know his own faults. And yet dreams vainly of defeating another. After that, you can defeat others. There is hard in the soft, there is soft in the hard. But know there is a difference between softness and weakness. He is not burnt up in fire nor drowned in water. Only after that think about technique. Do not violate the laws of society. Do not seek comfort for yourself. Do not play favorites (be free of bias). Think lightly of yourself and deeply about worldly affairs. Do not have many desires throughout your life. Have no regrets regarding personal affairs. Do not be jealous or envious of others. Do not begrudge yourself or others. Do not become infatuated with physical objects. Do not take fine foods for yourself. Do not pile up possessions. Do not overvalue the things you have. Do not become obsessed with having splendid weapons. When following the Way, do not be afraid of dying. Do not hoard money for your old age. Venerate saints but do not rely on them. Abandon self-interest, and do not seek fame or fortune. Never separate yourself from the Way of a Warrior. 1. Do not think dishonestly. 2. The Way is the training (Constantly forge body and mind). 3. Become acquitted with every art. 4. Know the ways of all professionals (crafts). 5. Distinguish between loss and gain in worldly matters. 6. Develop intuitive judgment and understanding for everything. 7. Perceive those things which cannot be seen. 8. Pay attention to the smallest details (even to trifles). 9. Do nothing which is of no use (don’t waste time on nonessential).